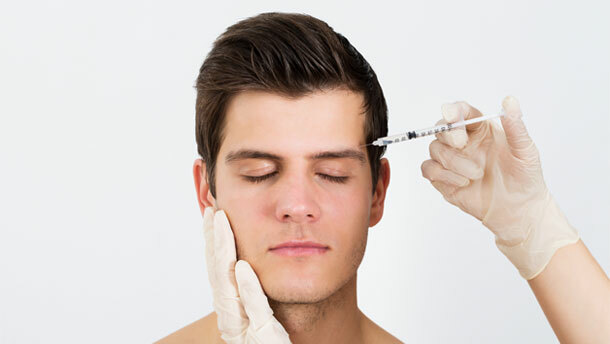 With the rise of social media, the ‘selfie’ movement, and all the vanity that comes with it, there has been a huge surge in the number of men having injectables and cosmetic procedures. There is absolutely nothing wrong with taking pride in your appearance, after all, we’re living in a time of gender equality (almost) and if it’s ok for women to indulge every now and then, men should too! According to a recently released study from the American Society for Aesthetic Plastic Surgery, the number of men getting Botulinum toxin injections (commonly known by its brand name as Botox) totaled 453,281 in 2016—can you imagine what this figure is at now in 2018? HUGE. Botox is injected into the facial areas where wrinkles appear in very small concentrations. The drug prevents signals from the nerves from reaching these facial muscles, effectively preventing the muscles from getting the signal to contract. For a short period of time (months) these muscles are effectively, paralyzed, hence the treated area retaining its elasticity. More specifically, injected Botox prevents the release of a chemical known as acetylcholine, preventing the contraction of the muscle cells. The effect of the drug causes a reduction in abnormal muscle contraction allowing the muscles to become less stiff. In plain-speak, Botox helps to stop those fine lines and wrinkles starting in the first place, and relaxes the existing lines that currently sit on your face. At Visjeune, you will have a consultation with your aesthetician several days prior to your first treatment; as we believe in giving you time to make an informed decision. If you are happy to go ahead with treatment, have filled in all the accompanying paperwork, and the aesthetician has given you all the information you need, then you will be booked in to go ahead with treatment. We promise, it’s not as scary as it sounds, BUT make sure you choose the right aesthetician to do your treatment. It’s crucial in this unregulated industry to choose a professional injector with many years of experience behind them, and we urge those seeking injectables to not just pop to your nearest beauty clinic on a whim, as you are potentially putting yourself at risk by doing so. Even if you don’t decide to go with our team at Visjeune, we still care deeply about the health and wellbeing of those seeking and receiving non-invasive/aesthetic treatments. Botox is not just used for cosmetic treatments; it can also be used for Hyperhidrosis (excessive sweating) and Migraines. There are so many amazing uses for Botox, so let’s break down the gender stigmatism that surrounds it. For more information, a free consultation, or just a friendly chat then call or email the team at Clinic Visjeune; home of top-quality, medically assured aesthetics and non-invasive beauty. How Do I Get My Lawn Looking Summer-ready?